MEXICO CITY (Reuters) - Thieves should have their hands chopped off, a Mexican presidential candidate said in a televised debate on Sunday, provoking disbelief from a moderator and setting off a storm of comments and jokes on Twitter. 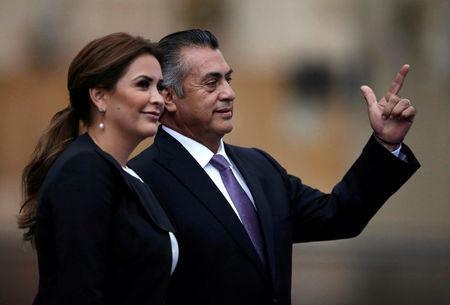 Jaime Rodriguez, an independent known as "El Bronco," who is trailing in opinion polls, made the proposal during a discussion about corruption in the first televised debate among the five presidential candidates ahead of the July 1 election. "We have to cut off the hands of those who rob. It's that simple," said the 59-year-old, adding that he would ask Congress to pass a law backing his idea. Taken aback, the moderator Azucena Uresti twice asked him if he was speaking literally, before checking again that he really meant what he had said. "That's right. That's right," he replied. Memes based on Rodriguez's comments rapidly spread through Twitter, among them an image of his face superimposed on a picture of what appeared to be an Islamist militant chopping off a man's hand. "El Bronco" was trending ahead of the other candidates on Twitter during the debate. Crime and corruption are top issues in the election campaign, with candidates under pressure to offer a way to end massive public graft and lower the number of murders from historic highs. Rodriguez's comments followed a long discussion about a proposal by election front-runner Andres Manuel Lopez Obrador to explore a vaguely defined amnesty to end a drug war, in which about 200,000 people have been killed in a decade. The idea is unlikely to gain much support in Congress, but if it were adopted would be a major shift in approach for Mexico, which prohibits the death penalty and torture. "It is not a bad thing, countries that have left corruption behind have done it," said Rodriguez, without giving details. Saudi Arabia and Iran are among a handful of countries in the world that permit amputation as a punishment. It was not immediately clear if the punishment envisaged by Rodriguez would be limited to public officials convicted of graft or apply to criminals generally. 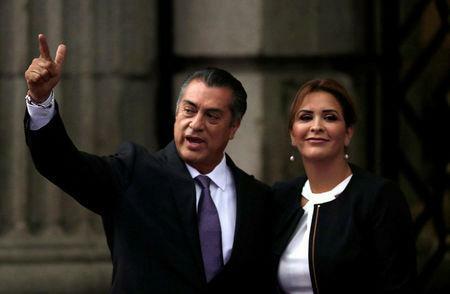 Elected in 2015 as Mexico's first independent governor, Rodriguez has taken leave from the job to run for president. He is in fifth place in most opinion polls.